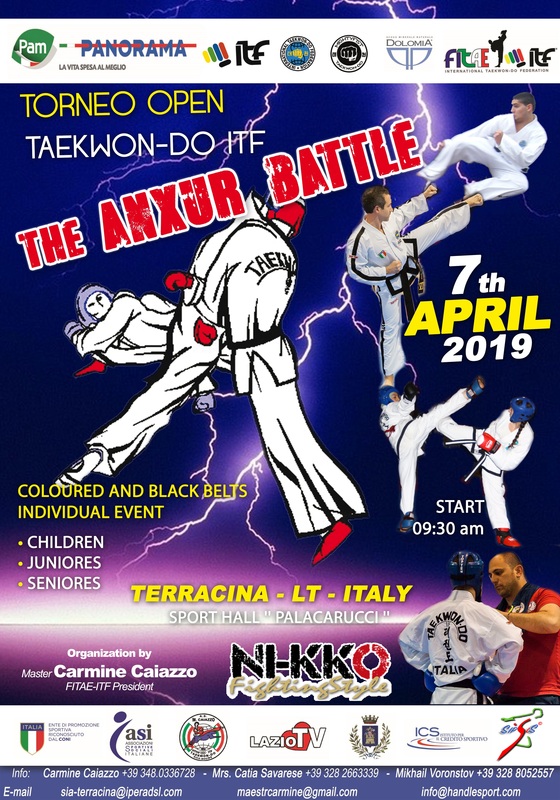 on Sunday 7th of April, 2019 in the sport hall “PALACARUCCI” Terracina (LT) Road “Viale Europa”. The tournament is open to competitors from 6 years old divided into Chicks (6-7 years), Dragons (8-9 years), Kids (10-11 years), Cadets (12-14 years), Juniores (15-17 years), Seniores (18-36 years). If it’s required a division for veterans (36 years and older) the organization can do it. The organization may add other categories if necessary. The competition includes Pattern and Sparring Competion and it’s just an Individual event. F.I.tae. I.T.F. rules will be applied. A nice holiday for competitors, officials and family members is guaranteed. Many low budget flights from alla over Europe fly to Rome Ciampino, Rome Fiumicino or Naples Airport. We are very much looking forward to your partecipation.